1) Hydrogen Peroxide - I LOVE Hydrogen Peroxide. I bought a 32 oz bottle for .89 cents at Target that will last me months. This is hands down the cheapest and easiest teeth whitening product out there. I rinse my mouth with 1 capful (the little white cap it comes with) for 1 minute with it every morning. THAT'S IT! This is the whitest my teeth have ever been. I drink red wine, coffee, tea, and sometimes I even sneak the occasional cigarette (I know, I know...). But this stuff just rocks. Other uses - mix it with vinegar and disinfect your house - totally organic, no harsh smell and super cheap. And I also comb some into my hair after I wash it...it makes really subtle highlights when you blowdry your hair. 2) Vaseline - I buy the generic, cheapest brand I can find. I can usually find a big tub of it for under $2. I use this for everything. I rub it on the heels of my feet every night before bed (yes, I have some mighty soft feet - thank you very much!) I use it to remove eye make up, rub it on chapped hands in the winter (works , like a charm), put it on lips over chapstick for a nice "lipgloss", rub a dab onto eyebrows to smooth and keep in place all day. 6) Rubbing Alcohol - Isopropyl - I bought 2 bottles for $1...it'll last for months. I use it to clean my cell phone (dip a paper towel into it and clean phone)....it cleans the germs off and makes the screen crystal clear. Just don't use too much...you don't want to drown your phone. A little goes a long way. I also soak my earings in a small dixie cup full of Isopropyl Alcohol before wearing. It cleans them and makes them nice & shiny, too. This is also a great first aid product - it disinfects small cuts and also works great on bug bites. Stops the itch/sting almost instantly. 7) Baby Oil - LOVE IT!!!! I use it on freshly saved legs as soon as I get out of the shower. Bye Bye razor burn! Rub it into your legs and let it absorb, then put your normal body lotion over it. Soft, silky legs with no unsightly red bumps or itching that sometimes accompanies shaving. I also use it on my kids after their bath...it's perfect for their sensitive skin. This is another product that you can buy for a few bucks and it will last many months. I've had my current bottle for close to a year! I have super sensitive skin, but need something that will really do a great job of removing the make up residue every night. This stuff rock. It's less than $7. I use it daily and have had it for 3 months. The best part about it is that it's so gentle, you can lather up the foam on the eyelids and it washes even the mascara right off. No burning or stinging eyes. 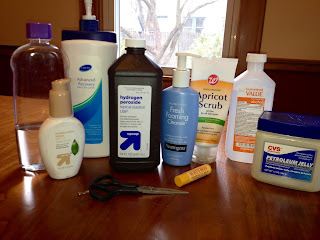 10) Weekly Face Wash - You need something that will really scrub off the dead skin without drying out your skin. I love Apricot Scrub. St Ives has one, but I buy the generic...you can find it anywhere. There's really no difference...so save yourself a few bucks. I use it once a week (twice a week in the summer when my pores tend to get clogged more often due to the heat & humidity). You'll feel the difference after just one use. Softer more radiant skin. Just be sure to follow up with a face moisturizer so you don't dry your skin out.